If you frequently looks for images on web and have already saved thousands of them, either for professional usage or for any other purpose, then your hard drive must be spurting with a lot of similar images. If you are a photographer, it must be a difficult job to select the best image among the pack of multiple shots of the same landscape. 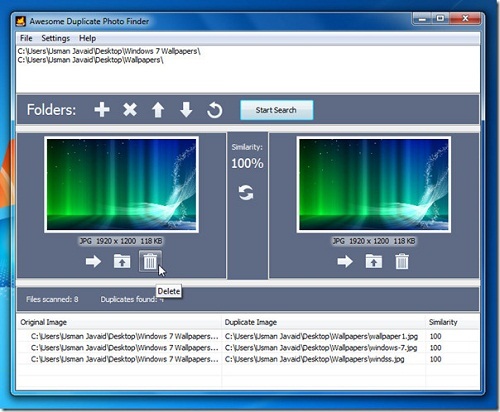 Locating duplicates is rather difficult and can drive anyone frantic especially when identical images have different file names. If you find yourself stuck in this situation and are looking forward to an awesome tool for finding & removing duplicate images, then Awesome Photo Finder can do what it’s name implies. To begin with, launch the application. Start specifying folder path where images are residing, you can add as many folders containing images as you want. After you have made the selection, click Start Search to start locating duplicate images in specified locations. 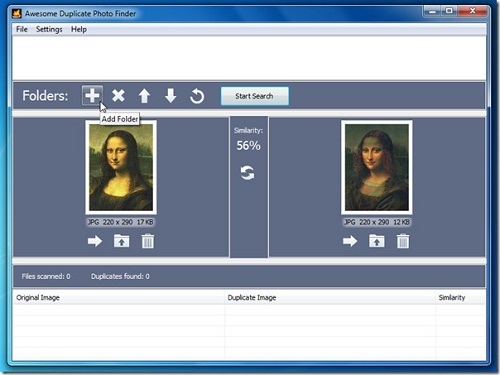 It will prompt you with scan results which includes number of images found to be similar. 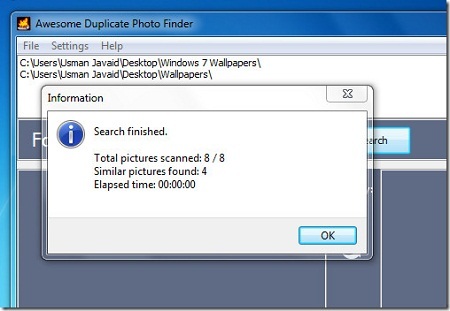 On click, it will show you the first duplicate images it found during the scan. Between the images’ section, you can see the Similarity percentage it found in the images. To view the similarity more sharply, you can also view them by double-click on the respective duplicate image, this will open the image in default image viewer. It provides three useful options along with locating duplicate images, you can move the duplicate image to another location, browse the location where it is residing and importantly delete the image instantly. Options are located beneath the duplicate images. At the lower part of the window, you can view the full path of duplicate files where there are residing.